Now that we are saying goodbye to 2012 (can you believe it?) and hello to 2013, I thought it would be fun to share my top 12 product favorites of 2012 (in no particular order). These are products I found myself going to again and again (even ordering more when I ran out of something). 1. Dear Lizzy Neapolitan Collection: Soft colors, feminine florals, and mason jars. Who can resist mason jars? 3. Jillibean Soup Alphabean Stickers: Perfect size. Perfect font. 4. Bella Blvd. Flags: Flags and banners were all the rage this year and work well when you need just a "little something" for a project. 5. Simple Stories Summer Fresh Collection: The burlap and denim won me over as did the memorabilia pockets. 6. Little Yellow Bicycle The Escape Collection: Perfect for travel (and even school) photos. 7. 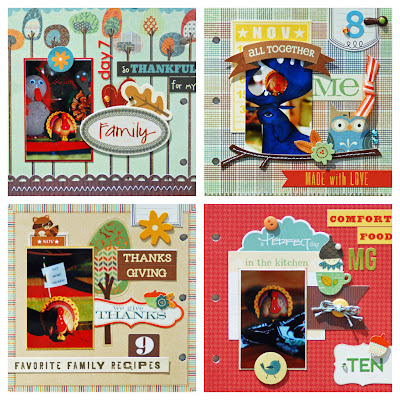 Simple Stories Harvest Lane Collection: Loved the fall colors with a touch of aqua. 8. 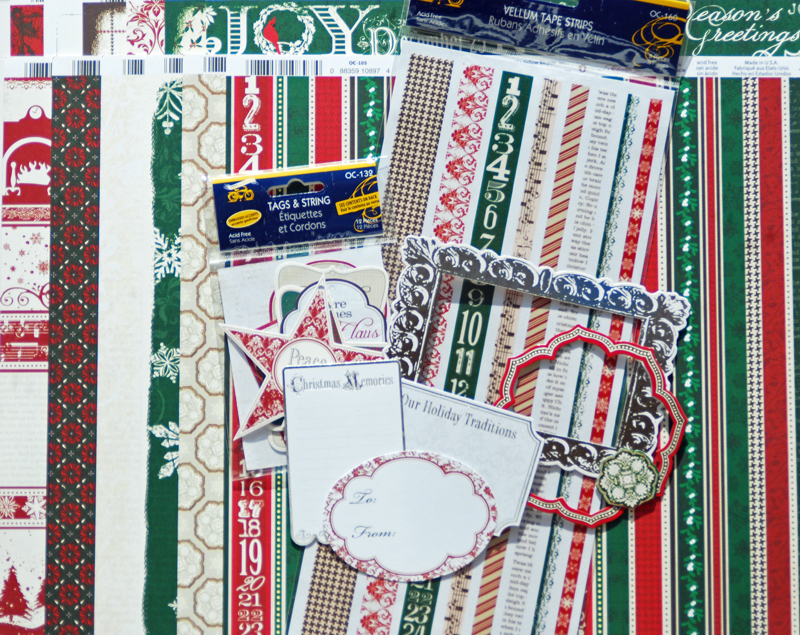 Doodlebug Pearls: Each package contains three sizes of pearls in two color shade variations. 9. Whisker Graphics Polka Dot Bitty Bags: Love to use these to hold journaling cards and tags. They come in a number of different colors. 10. Simple Stories Sn@p Collection: Fun and colorful and perfect for just about any photo. 11. 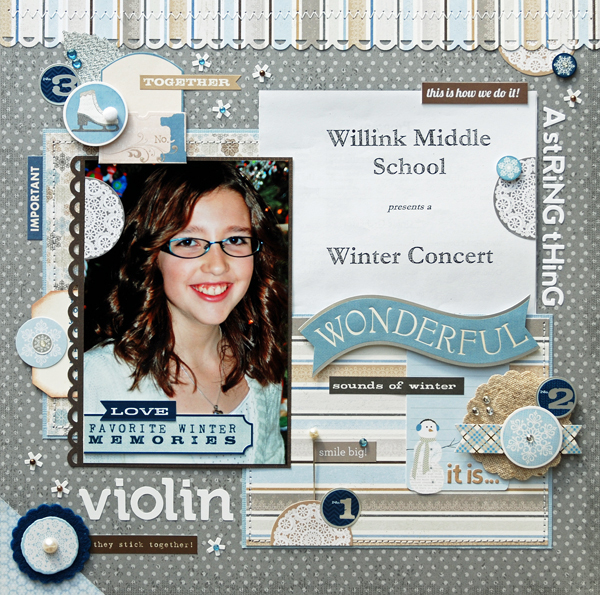 Little Yellow Bicycle Winterings Collection: A totally stunning winter collection! 12. 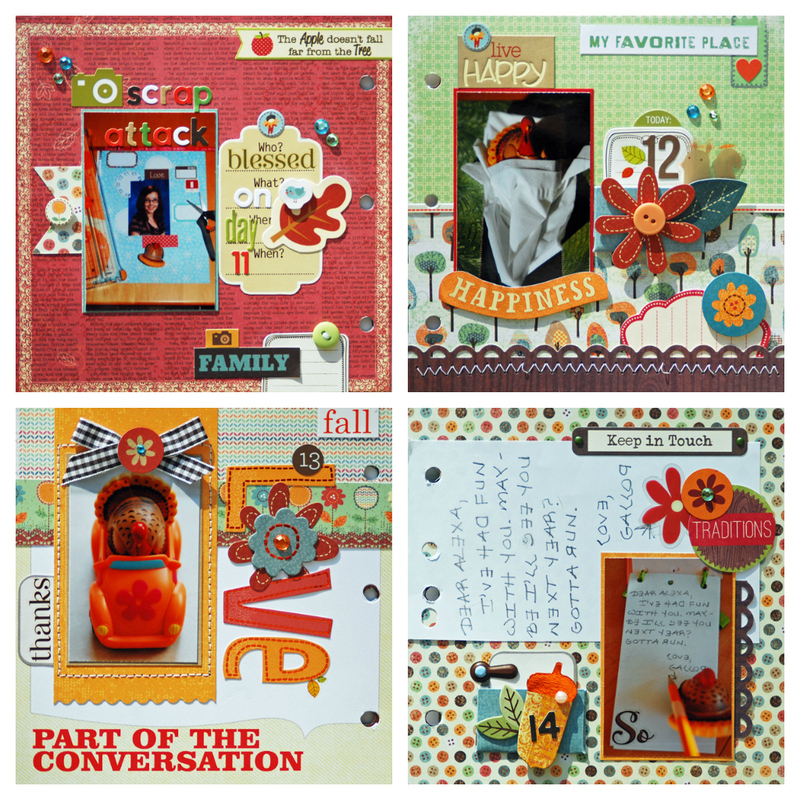 Studio Calico Calendar Pockets: Another great way to store memorabilia or journaling. Alexa's first middle school orchestra concert was a few weeks ago. It's always fun to hear the whole orchestra play together when you've only heard your child practicing their part alone. I'm so proud of her and the poise and calm she showed before the concert. I don't think I was that pulled together before performing in front of an audience when I was her age. How about you? This is pretty much all Little Yellow Bicycle Winterings with bits of Pink Paislee, Simple Stories, Doodlebug and October Afternoon. I sewed a pocket to the polka dot paper using a blue cardstock base layered with the striped paper. This allows the concert program to be easily removed at any time. I really love how the program looks as if it's part of the page design. Have a great weekend! I'll be back next week. The random number generator came up with number 11 as the winner of my Little Yellow Bicycle Once Upon a Christmas giveaway. Who was the eleventh reader to comment? My favorite holiday tradition is doing advent with my daughters in the evening. A great way to close out our days. Thanks so much for the chance to win! Before Christmas is upon us next week, I wanted to share this layout about our 2012 Thanksgiving. The journaling is in the kraft envelope. I used mostly Simple Stories Harvest Lane on here, but there are bits and pieces of Little Yellow Bicycle, Bella Blvd. and Jillibean Soup too. 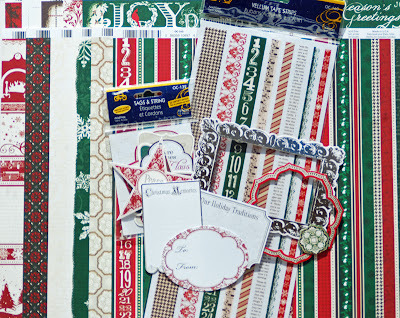 As a little gift to you this holiday season, I am giving away items from Little Yellow Bicycle's new Christmas collection, called Once Upon a Christmas. What do you have to do? 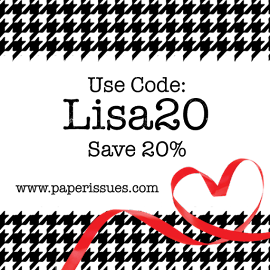 Just leave a comment on this post telling me about your favorite holiday tradition. :) I will choose a random winner on Wednesday, 12/26 and post the winner on Thursday, 12/27. 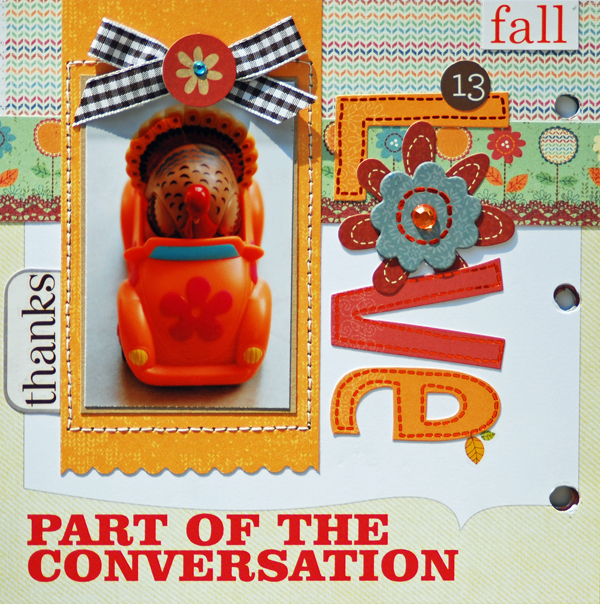 Thank you all for visiting my blog this year, for your encouragement, and most of all, for your friendship. Merry Christmas and Happy New Year! Rather than worry about leaving space on each page for journaling, I chose to do a summary page at the end of the album. 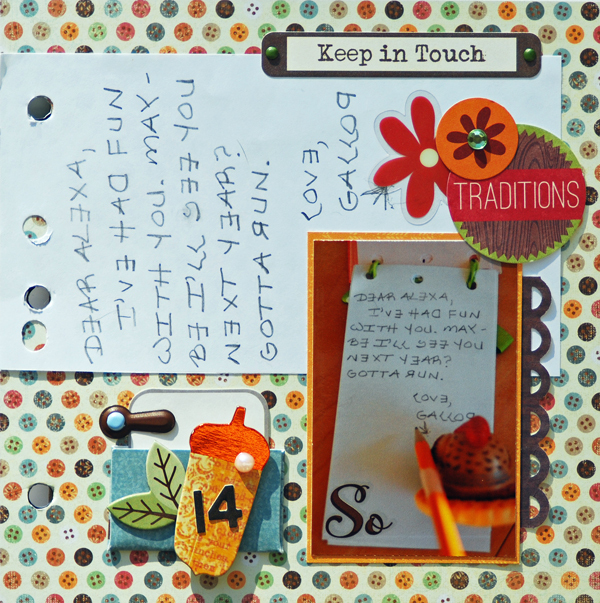 The journaling card is easily removed for easy reference. I actually did the cover LAST. I used Little Yellow Bicycle's new canvas alpha stickers for the title, inking each one a different color to match the colors inside the album. I really like all of the seasonal colors together. Here's a look back at all of the pages. They are all punched and ready to be bound. I also went back and added in a few embellishments here and there. Today I'm sharing Gallop's adventures during his last days with us. Day 13: Gallop went for a joy ride. Day 14: Gallop penned (well, penciled really) his goodbye letter to Alexa). 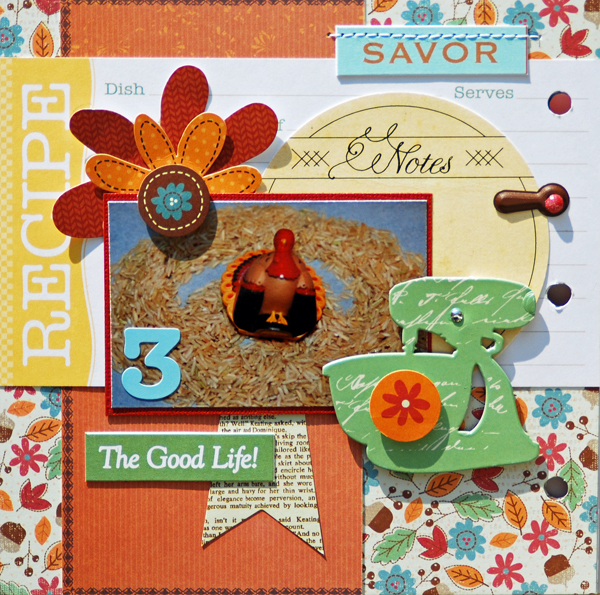 We're nearing the end of my Turkey on the Shelf mini album. Just a few more pages to go. Here are days 11 and 12. 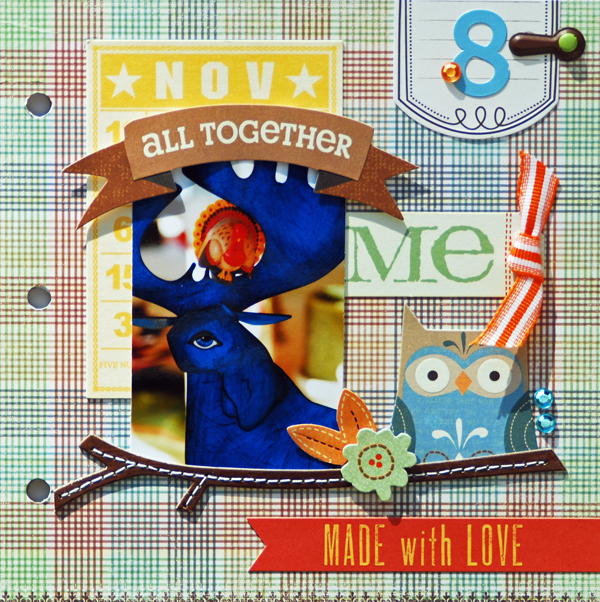 Day 11: Gallop tried his hand at scrapbooking Alexa's school picture. I think he did a pretty good job, especially since he worked mostly with stuff he found in the trash can. LOL! Day 12: Gallop is getting pretty worn out from all of his antics. Time for a nap with a fluffy tissue pillow and blanket. Definitely take a look at this collection! 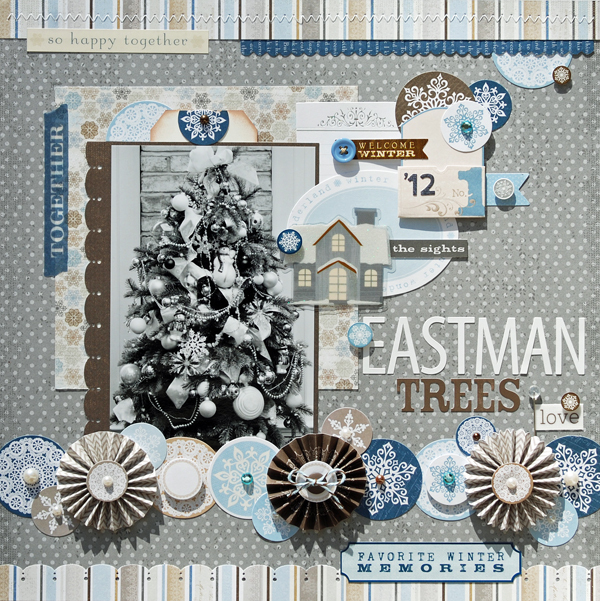 It's beautiful and so versatile, and not just for winter-themed pages. 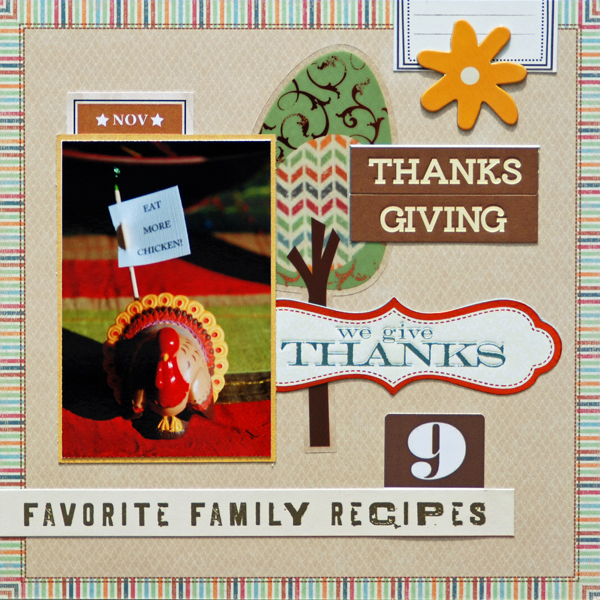 This page is actually about our Thanksgiving trip to Pennsylvania. :) Did I mention that one of the papers actually looks like a cable knit sweater? It's my favorite. See you tomorrow! Have a great day! 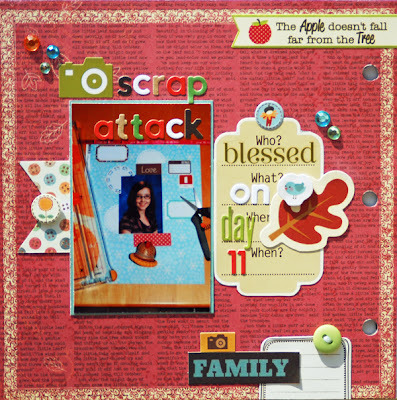 This is an older layout that appeared in the most recent issue of Scrapbooking & Beyond magazine. I took this photo shortly after we adopted our cat, Butterscotch. He looked so cute sitting in the branches of our Christmas tree. Maybe he thought it was a kitty condo. LOL! He hasn't climbed the tree since although he sure loves to get cozy under the tree. He's even been known to stash his favorite toys (pom poms) under the tree skirt. It's always a surprise to see what he has stashed in there. 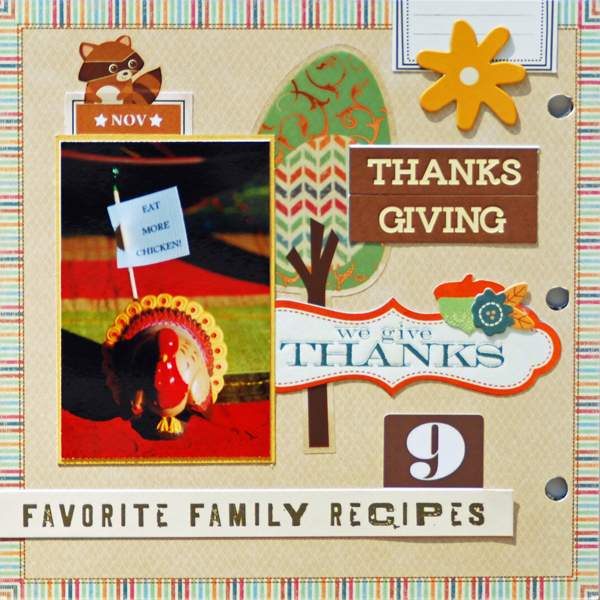 Day 9: With just a week to go before Thanksgiving Day, Gallop is encouraging us to eat more chicken, not turkey. Day 10: Gallop overindulges in Halloween candy. 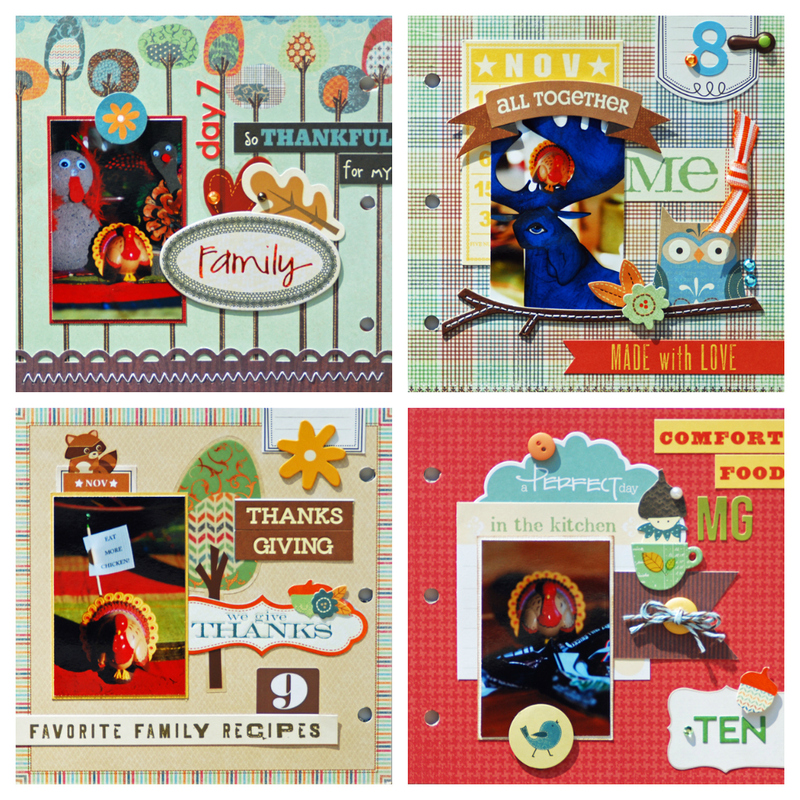 I'm sharing a few more Turkey on the Shelf mini album pages today. 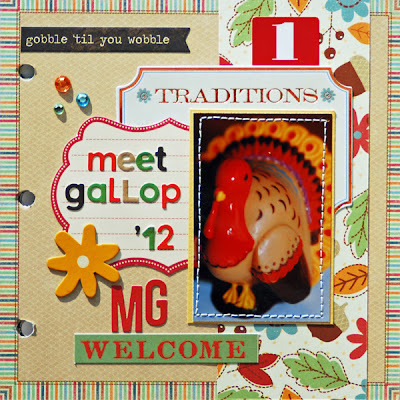 Day 7: Gallop meets up with members of his family to catch up on happenings in the poultry world. Day 8: Is Gallop considering extending his stay through Hanukkah? Today he seems to have the ear of Mr. Moose Menorah. If nothing else, he’s seeing the world from a different vantage point. Day 6: Gallop decides to try a piece of Alexa's favorite licorice. Have a great weekend! I'll be back next week with more pages and projects to share. Today I'm sharing a couple more pages from Gallop's Turkey on the Shelf mini album. Day 2: Gallop has been a couch potato all day. He told me that he's developed a love for popcorn because it's a refreshing change from the corn kernels he usually eats. Day 3: Gallop got into the rice container, spilled it on the counter, and made a snow angel. I'll be back with more pages tomorrow. Have a great day! 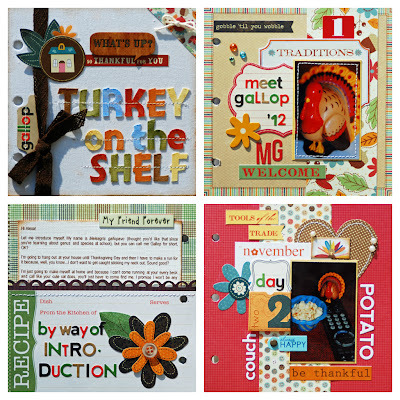 Gallop's Turkey on the Shelf adventures are now being committed to paper (a mini album to be exact) for all time. 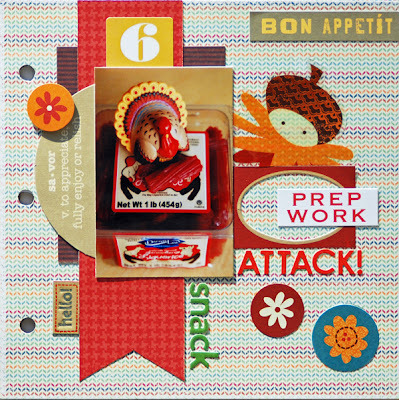 I'm using mainly Little Yellow Bicycle's Acorn Hollow collection with additional embellishments from Little Yellow Bicycle's Savor collection. Here is Gallop on Day 1 when he appeared at our house. Little did we know the trouble he'd get into in the coming days. If you may remember, he brought along a note of introduction as well as his belongings. 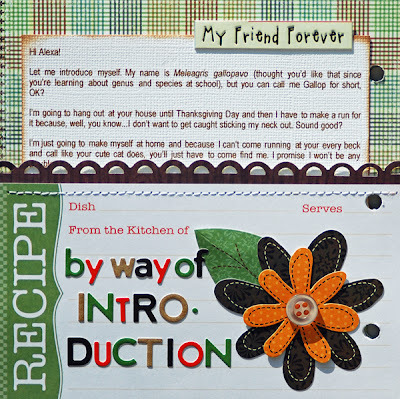 I used a recipe journaling card, from Little Yellow Bicycle's Savor collection, to create a pocket to tuck the note into. This way it can be taken out at any time. I'm so excited to be taking part in Debby Lewis' annual 12 Days of Home for the Holidays (thanks so much for inviting me, Debby)! I'm up today with a look at some of our favorite holiday traditions, layouts and crafts from holidays present and past. 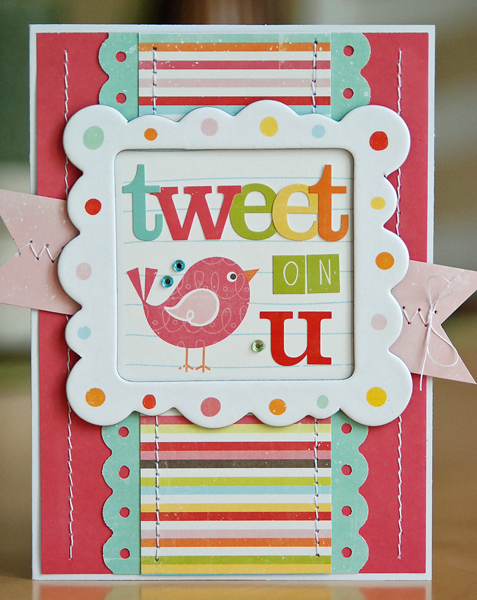 Pop on over and take a look. You won't be disappointed. Check it out (and the other 11 days too) at D's Paper Studio.